The Gondoliers; or, The King of Barataria is a Savoy Opera, with music by Arthur Sullivan and libretto by W. S. Gilbert. It premiered at the Savoy Theatre on 7 December 1889 and ran for a very successful 554 performances (at that time the fifth longest-running piece of musical theatre in history), closing on 30 June 1891. This was the twelfth comic opera collaboration of fourteen between Gilbert and Sullivan. 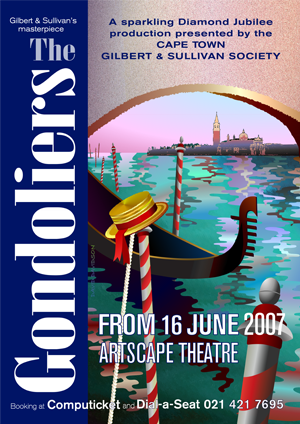 The Gondoliers was Gilbert and Sullivan’s last great success. In this opera, Gilbert returns to the satire of class distinctions figuring in many of his earlier librettos. The libretto also reflects Gilbert’s fascination with the “Stock Company Act”, highlighting the absurd convergence of natural persons and legal entities, which plays an even larger part in the next opera, Utopia Limited. As in several of their earlier operas, by setting the work comfortably far away from England, Gilbert was emboldened to direct sharper criticism at the nobility and the institution of the monarchy itself.